Hey ya'll! We're getting closer to Friday. I'm still working on some Valentine's things, and doing so as frugally as possible and with what I have on hand. 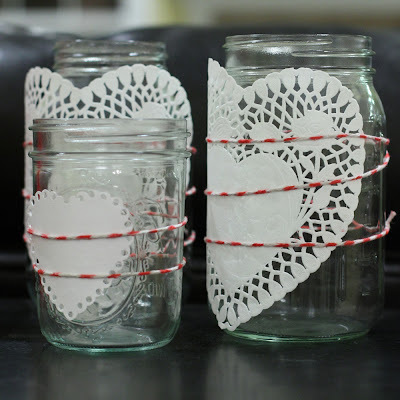 You may have seen these heart doily jars on pinterest or in blogland. Sumo made her version with baker's twine. I wanted to make some using heart shaped doilies and baker's twine, but I didn't have baker's twine and didn't want to buy any. the cotton twine from my disastrous twine balls! I grabbed it up along with a red marker and stretched some out on a piece of paper. I just colored every 1/4 inch or less, flipped it over, and colored again. Note: I did get ink on my hands doing it this way, so the video tutorial may be a better way. Nonetheless, I made my own baker's twine. 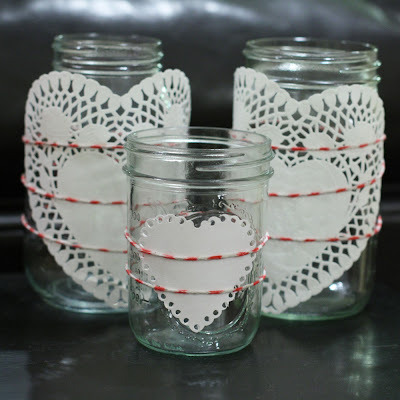 Then I used it with some heart doilies, two Ball jars and a random jar I had on hand to make some quick Valentine's decor. For the small jar, I punched a heart with a scalloped heart punch and then punched holes in each of the scallops. I'm happy with my little display. This is really cute!! I love cute and simple projects!! 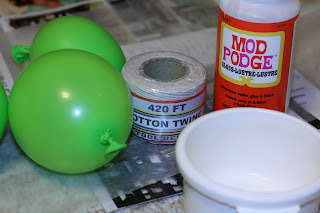 Check out my blog too :) I also have a linky party going on.. I would love it if you shared your creation. So sweet! I agree with Christine.. cute and simple rocks! Thanks for sharing with us! These are so cute! 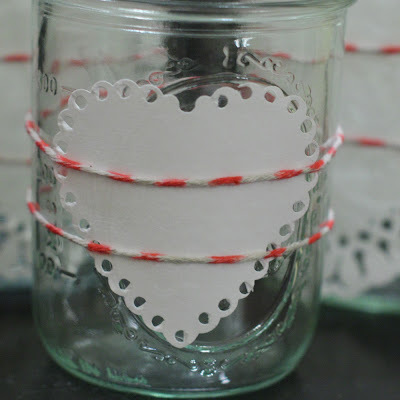 I hope you will link up to my I Heart Projects Linky Party. What a cute and simple idea! I love it! I have seen these on Pinterest and love the idea! I am glad to see that that they really do look fabulous for real...you never know what the results are when you try Pinterest projects! My weekly Pinterest party is on now. Please pop by if you have 5 minutes to check out some of my favourite pins! Love these! They are precious. I saw them on Pinterest and have been meaning to get around to make some myself! Now I will have to so I can add them to my mantle! Great idea. I love bakers twine but don't always have the color I need so this is a wonderful way to take care of that! super cute jars! great idea! I really like the cute twine you picked out! Wish I would have seen this earlier. So cute! Working on a 50's themed kitchen wedding shower. Would have been cute with Ball jars.